Coach Matt Chance isn’t always a big fan of the spotlight – but he’s a huge fan of the kids he coaches and is a huge fan of Bowling Green athletics – which is why the community is a big fan of his and he’s been thrust into the spotlight. The community has attempted to show Coach Chance just how much they love and appreciate him in the form of votes in the “Most Valuable Coach” contest that is being sponsored by U.S. Cellular. He has been at the top of the list for this national contest since it started in August. While he dips to second place every now and then to Chris Metzger, a football coach for Pinecrest in North Carolina, the area keeps boosting Chance back into the lead. 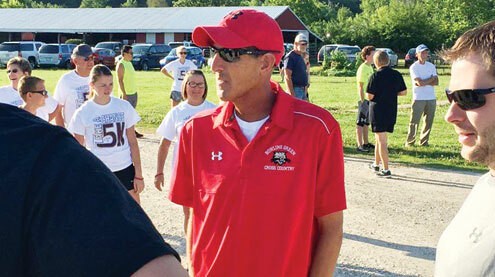 The voting ends on Nov. 13 and area fans are hoping to keep the 20-year BGHS cross country/track coach at the top to win a prize package that includes a $50,000 grant for the district from U.S. Cellular and a Samsung technology package worth $30,000. Chance said he was very surprised to make the top 50 when the field was initially narrowed on Sept. 10. He added that he was even more surprised when he was a finalist in the top 15. “People in the community have really rallied around this contest along with my friends, family, and teammates from high school and college. They have been persistent in getting their votes in every day and making sure everyone is voting. It’s been very overwhelming – in a good way,” Chance added. In addition to being a phenomenal coach, Chance is a highly-decorated athlete. He played four sports in high school including cross country, basketball, track and baseball. He went on to be a three-time All-American in track at the collegiate level. He was inducted into the Simpson College Hall of Fame in 2016 and is the college’s only multi-time All-American distance runner. Chance graduated in 1997 with degrees in physical education and health before earning a master’s degree in education from Lindenwood University in 2002. He is the Bowling Green R-I athletic director and has headed up the school’s cross country and track programs for 20 years. The program’s are known around the state for turning out top contenders. Chance said he was drawn to coaching through his own high school and college coaches. “[They] took interest in me as an athlete and they had a tremendous impact on how my life shaped out. These coaches always pushed me to be the best I could and guided me to be a successful athlete and person,” he explained. Chance says he loves every minute of coaching at BGHS. When asked what moments/seasons stick out from over the years, Chance is quick to point out there are a great deal of wonderful memories. He notes the boy’s cross country state championship in 2009, back-to-back 4×800 meter relay teams in 2016 and 2017 along with the many conference and district championship memories from track and cross country including the 10 state cross country trophy teams. Chance said it means a great deal just to have been considered in the top 15 of the contest and noted the opportunity to win the award is very special. Chance has remarked before about how much the community has rallied behind him and his family in the good times and the scary times. In addition to his list of achievements, Chance also battled stage four cancer. The public is encouraged to vote daily online at www.themostvaluablecoach.com. Nominations for the contest started on Aug. 21 and the field was narrowed to the top 50 on Sept. 10. The top 15 were identified on Oct. 8. Voting will continue until Nov. 13. Winners will be announced on Nov. 20 following a review by the judges. A rally was held in Chance’s honor on Tuesday, Oct. 9. Representatives from U.S. Cellular, including staff from Cellular and Satellite Center in Bowling Green, were on hand to present Chance with a $5,000 check for BGHS. The grand prize winner will receive a $50,000 grant and a Samsung technology package worth $30,000 for their district. The coach who finishes in second place will receive $20,000 and the third place prize is $10,000. Chance hasn’t dropped below second place since the voting became serious business.